I could write a book, and maybe I will, about dragging children through museums and monuments. More often than not it is a fat bribe that does the trick; the promise of something good to eat and the chance to pick out a nice gift in the shop. And so it was with real excitement that I read Nick Trend’s article in the Daily Telegraph about taking his family to Ostia Antica, the ancient port of Rome. Here I had found the description of a perfect NoCrowds adventure, a huge, totally underutilised archaeological site that had engaged and entertained a family for an entire day. Who could resist. We ended up inviting Eloise’s godfather to join us for our excursion. In addition to being an avid historian, a fluent Italian speaker and pretty good translator of Latin graffiti, he also owns a car. The 20 mile drive from Rome was easy enough but for anyone without an Italian speaking, driving godfather, there are also good public transportation options such as the metro and even the possibility of travelling by boat. The official site of the Soprantindenza gives the most up-to-date opening times but is only available in Italian. Try http://www.ostia-antica.org/ if your Italian is not up to snuff. After the noise and incessant activity of Rome, Ostia seemed to us to be a green, romantic haven. In its hey-dey in the 2nd century, this would not have been the case as a thriving population of 100,000 inhabitants went about the business of supplying the city of Rome with goods imported from every corner of the ancient world. Within this city devoted to trade and commerce, with a main street that runs for over a mile, one can still find the remains of apartment buildings, hotels, brothels, bars, baths, communal latrines, workshops, storage buildings, a forum, temples and more. During our visit, we had this 10,000 acre ancient harbour city virtually to ourselves with only occasional sightings of badly behaved Italian school children. Eloise was impressed by their irreverence. One of our Italian friends who read this posting feels strongly that these children must have been French. In any event, Ostia is a completely relaxed place where children can climb happily over the ruins and no one seems to mind. I’m sure the archaeologist do, but there were none evident during our visit. While extensive, Ostia is smaller than Pompeii and one comes away with a real sense of how a Roman town was laid out and operated. But it was the connection to Caroline Lawrence’s children’s mystery story, The Thieves of Ostia, which made the site come alive for Eloise. The book opens in the Necropolis as did our visit and as we continued to uncover the locations described so accurately by Lawrence in the story, Eloise began to buy in to the idea that not all tourism promoted by her parents is boring. As a NoCrowds experience, Ostia rates 5 stars and demonstrates that within easy reach of Rome, one can still wander alone through the skeletal remains of an ancient city and have an intellectually absorbing, bucolic and and amusing time. This is what tourism should be all about. Go there. 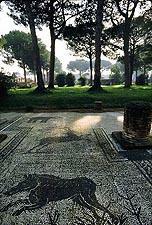 The ruins of Ostia Antica are open seven days a week, from 9 in the summer and 9:30 in the winter. Admission 5 Euro. Allow at least four hours for your visit.